We are devoted to finding innovative independent artists who are creating groundbreaking work in their respective fields, and giving them a place to celebrate their artistry. We are looking for edgy, unique, and thought provoking pieces with a fresh voice. If this defines the type of work you are currently creating then we would love for you to submit your project today! Each season we give filmmakers the opportunity to submit their latest work and compete with others. Films entered in MULTIPLE CATEGORIES may win multiple awards! Each Monthly winner will get a digital laurel, a digital certificate, and has the option to purchase a trophy. At the end of each season, a "BEST OF THE MONTH" trophy is awarded and delivered to ONE top rated project. At the end of twelve seasons, a "BEST OF THE YEAR" trophy is awarded and delivered to ONE top rated project selected from a pool of winning films in the previous twelve months. Festivals such as Royal Wolf are such a boon to filmmakers both new and experienced. They offer a terrific platform to be able to showcase your work and the online nature is a great way to gain exposure internationally. They were fantastic communicators and we were so pleased they chose to honour us with an award. Would recommend 100% to anyone looking to get their films into the world. Good film competition. Good communication with the organisers. After winning one of the previous monthly editions of The Royal Wolf Film Awards with one of my films, I really enjoyed receiving a personalised digital certificate of achievement, something than not many festivals do. It looks great and it also represents a nice personal touch from the organisers. Keep up the great work! Fantastic! Was awarded Best Short Film (drama) and Best Director for my film Being Wild - the organisers were very firendly and supportive! Sent through the awards very quickly too! We are so glad you loved our horror drama series The Grimoire Chapters. Fantastic festival to be a part of! Great, attentive staff that really care about the filmmakers involved. All while showcasing creative, exciting films. Truly not to be missed. Hope to submit again soon. Great festival. I've had the pleasure of submitting several projects and each time it's like the first. Royal Wolf Film Awards you guys are awesome. Keep up the great work !!!!! Fly Girl...Fly "An Urban Love Story"
We are thrilled that our film Kissy Cousins Monster Babies was associated. First, with a title like ours, you need a festival that is going to truly look at independents. Plus they follow you and promote your film on Twitter & social media. Great festival with good communication and on the ball updates. Nice cert to boot as well so overall, worth a punt. 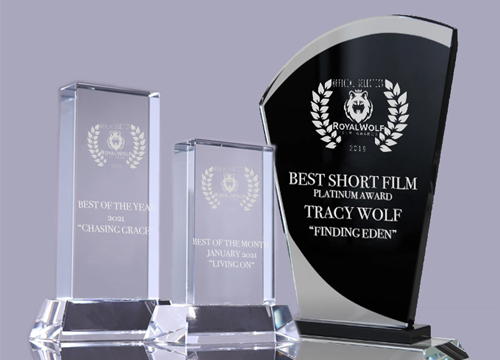 Royal Wolf Film Awards proudly accepts entries via FilmFreeway.com, the world's best online submission platform. FilmFreeway offers free HD online screeners, unlimited video storage, digital press kits, and more. Click to submit with FilmFreeway. Copyright © 2018 Royal Wolf Film Awards. All Rights Reserved.